If you are travelling along the old Roman road Via Ausonia through the Haardtwald forest towards the village of Gräfendhron and have passed the small connecting road Talling-Berglicht, you will eventually encounter a less conspicuous and easily overlooked signpost with the inscription "Berger Wacken". This leads downwards from the Roman road. 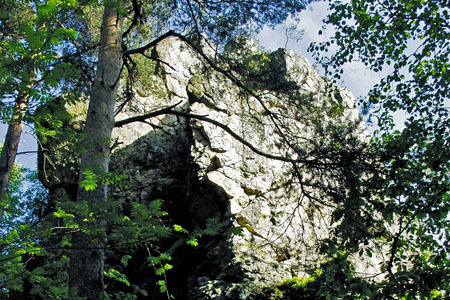 After a few minutes you suddenly reach enormous rocks, which are hard to make out among the dense trees, even though they are several meters high. They are composed of very hard quartzite rock, which is part of a quartzite ridge several kilometres long that is visible here. A visit to this natural monument should not be missed. Back on the Roman road, a little later you pass the turnoff towards the solitary mystic spring Haardtquelle located on a wood glade and surrounded by dark forests. A mineral spring with natural carbonation from 100 m deep is located there. The carbon dioxide, which visibly escapes in small bubbles, gives the water a fizzy freshness with a slightly tart flavour. Further along the Roman road, far below near the village of Gräfendhron, you reach valley of the Dhron stream, across which is an old stone bridge with two low arches, supposedly in the same place as in Roman times. From Gräfendhron the trail leads up the valley to Hunolstein, where the remains of a castle from the end of the 12th century is picturesquely situated on a quartzite rock high above Dhron Valley. The rocky peak of the castle offers a magnificent panorama. According to local legends in Hunsrück, Hunold, the fighting companion of the grim hero Hagen von Tronje from the Nibelungenlied, was once lord of the castle here and reigned over the entire Dhron Valley.